Collegiality is evident throughout the profession, but competition for work is still fierce. Size defines and defies the practice of law in Halifax. Because the bar is not large, faces, personalities and practices quickly become familiar. But familiarity does not breed contempt. In fact, the opposite is true. Support for colleagues is part of the fabric of life as a lawyer in Halifax. The reality is that an opponent today can be an ally tomorrow. At the very least, you can be arguing against a lawyer in court in the afternoon and having drinks together at a bar function that night. “Most counsel deal with each other with respect and courtesy. Battles are left in the courtroom and not brought to the streets,” says Ray Wagner, founder of Wagners – a Serious Injury Law Firm. Being nice, however, is not synonymous with being less proficient or less effective. “I’ve seen the pleasant attitude, which is not to be mistaken for being a pushover,” says Mohammad Raza, an associate with Cox & Palmer LPP, a full-service regional firm with 200 lawyers in four provinces. Raza discovered the resolution behind the smiles, and more, when he moved to Halifax in 2014 after having worked as a lawyer in several countries including Pakistan, Belgium and Italy. It is likely that Halifax’s “Big Three” will remain a triumvirate for some time. At present, boutiques are more popular than full-service firms, says Wagner. Indeed, as 2016 came to a close, Mathews Dinsdale & Clark LLP, a labour and employment law firm with offices in Vancouver, Calgary, Toronto, Sault Ste. Marie and Sarnia, Ont., announced it would become the first national boutique law firm to have locations from coast to coast. “Lawyers in Nova Scotia have the benefit of comparatively lower overhead and hourly rates than large centres across Canada. With the advent of technology and fewer mobility restrictions imposed by law societies, we can be at home and do great work for clients wherever they are,” says Tara Erskine, who is leading operations for Mathews’ Halifax office. While business may be solid, even increasing, for larger and mid-sized firms in Nova Scotia’s capital city, sole practitioners and small firms often struggle. “We have a smaller client base and anecdotally lawyers tell me it is pretty rough and competitive,” says Deveau. Boutiques are required to place their clerks with other firms, he notes, and arrangements are difficult to make unless you are willing to pay their salaries while on loan. Major changes are also afoot for the profession as a whole. The Nova Scotia Barristers’ Society is creating a new model that will focus on regulating entities. Entire law firms as well as other legal groups or parts of organizations such as a department of justice or a workers’ compensation appeals tribunal will be licensed. As part of the shift envisioned by the NSBS, this new form of regulation will promote mitigating risk instead of slapping wrists. The emphasis will be on compliance in the broadest sense, not in detailed reporting and documentation. Guided by 10 principles, which emanate from the society’s code of conduct, large firms, departments, boutiques and other legal entities will be required to demonstrate adherence to the spirit rather than the specifics of society rules. Stewart McKelvey, she notes, “is almost all run by women and one-third of the partnership board is female. We’ve made huge strides.” One of those huge strides was historic. Two years ago, Lydia Bugden became the firm’s chief executive officer, one of the first female leaders of a major law firm in Canada. Even working in Halifax may look different from working elsewhere as a lawyer. 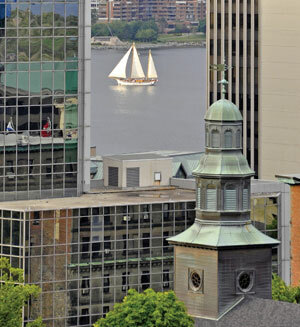 As Saturley spoke with Canadian Lawyer, she noted that outside her office window in the city’s downtown, a navy ship was making its way slowly up the mouth of the harbour. It is a common sight. In Halifax, it’s the seagulls you have to watch out for.